One evolution in golf course design is that new courses are usually not friendly to walkers. They are often built in subdivisions or in rugged terrain, necessitating holes to be spread out and with long distances from greens to tees. It’s also a good source of revenue for courses to rent carts. But, alas, Kansas City still has a lot of courses you can walk, some much less strenuous than others. We have played and walked all but one of the courses below. Based on that experience and chats with some of the pro shops, here is our rundown on walkable courses. This has always been one of my favorite courses in Kansas City. The holes border woods or tall-grass meadows and two holes on the back have great views of the lake, especially since recent course renovation.. This is also a very walker-friendly course, with only a couple of long uphill treks on the front nine. Tees are handy from the preceding greens. The course has all new greens, all the more reason to tee it up here. Until the recent replacement of six holes, St. Andrews was a breeze to walk. It’s more of a challenge now as all six new holes are nothing like their flat, plain predecessors. The new holes – 1 through 3 and 13, 14 and 15 _ feature several steep up and down walks. But catch your breath on the other 12 holes and enjoy walking this popular and much improved course. One thing to note, though, is that the tougher new holes have probably added 15 minutes to the average round at St. Andrews, especially for walking groups. There are few easier courses to walk than Overland Park, one of the busiest venues in the metro area because of its low rates and convenient location in south Johnson County. The South nine is the least-trying walk. The last four holes on the North course are a challenge to the stamina, especially the long, uphill par 5. But overall, these two nines should be walked. You have to take a cart to the distant West Links, but you can ride nine there and still walk the South or North, which didn’t used to be the case if you played West first. This course in Blue Springs is for serious walkers, and serious golfers. 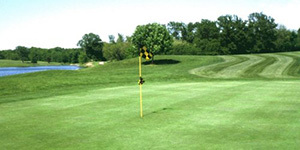 Adam’s Point has a great variety of imaginative holes that definitely favor local knowledge. There are numerous target landing areas out of view from where shots are taken. Those on a cart have the advantage of driving ahead for a look. Walkers will encounter some long, hilly holes and a few hikes from tee to green, but there are tougher waking courses in Kansas City. Adam’s Point has such an interesting layout and walking is a better way to truly absorb the course’s nuances. This course turned 100 years old in recent years, making it one of the area’s oldest and most historic. The first two holes are pretty flat but then comes the ascent to number 3, which would poop anyone out. Golfers may recall when there was a cable carriage to transport players to that tee. Now, a ranger gives golfers a lift. Same story to get to uphill to 13 tee. Once in the high country, where most of the course is located, the holes are fairly walkable. But be ready for a challenging and sometimes unnerving round as even some shots landing in the fairway will drop into the abyss on this venerable Johnson County-operated layout. Pick your line and hope you hit it. 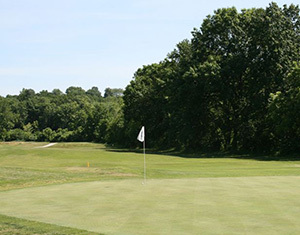 This south Johnson County-owned course would be pretty kind on walkers if not for a few very long paths from green to tee, such as from the first to the second holes. 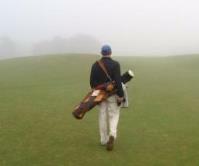 On those minor treks, it’s best to take in the scenery and focus on the next hole. If you are playing with someone alone on a cart, you can probably hitch a ride to certain tees. The holes themselves are without many severe hills. As an aside, some have shared that Heritage gave away a lot of its natural beauty by cutting down the tall prairie grasses between many of the fairways. It does speed up play and make more balls easier to find, so there are some perks to change in the course’s set up. If you have an affinity to water – as in view, not as in where your ball might land – it’s hard to beat these two courses overlooking Smithville Lake. Golfers will absolutely love some of the holes along the water, such 4, 5 and to 6 at Posse. Very picturesque. Somehow, settings like this can be better appreciated on foot. That is not to say that either of these courses is a walk in the park. There is some rolling terrain, but walks from greens to tees are not difficult and there are shortcuts for walkers in some places. Paradise Point, perhaps because of its perceived distant location up north, is usually pretty easy to get on and has relatively low fees. It’s the next best thing to getting out of town for a round and very much worth it, walking or riding. One downside to walking is that you can be worn out by some shots. Take the first hole at Swope. If you hit it down the right side, the ball will end up in a large basin, which means walking way down and way back up. Keep it on the left, the hole walks easily. It’s this way a lot on Swope, which is no doubt a test for walkers overall. It certainly provides incentives for walkers to hit the right spots so they can limit their fatigue. But this A.W. Tillinghast design is one the area’s most historic and challenging courses. If you must, walk one nine and ride the other, but give Swope a try if you haven’t already. And by all means, hit it straight. This is one of the easiest 18-hole walking course in Kansas City. I’d almost be embarrassed riding this flat par 70 course that plays less than 6,000 yards from the back tees. The slope is just 107. But this course is great to have around. Not everybody wants to play tough, hilly courses. There should be courses for all levels of players, including beginners or those who want to combine exercise with the fun of the game. Minor Park is that kind of course. This is one of those badge of honor walking courses. “You’re going to walk Sunflower?” people might ask. 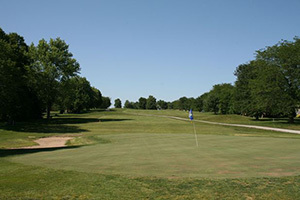 The course plays 7,000 yards and sports a 132 slope rating. It’s not so much the occasional hilly fairway as it is the strenuous hikes to tees on 7, 11 and 12 that challenge walkers. If you have the honors, just let other players tee off first to catch your breath. Sunflower is demanding course and not especially hard to get on. It will keep your attention and bring you back, maybe in better shape for having walked it. Bravo for newer courses made for walkers. Opened seven years ago when so many new courses favored cart golf in winding subdivisions, Drumm is a long but walkable venue. The most arduous part is walking from 13 green to 14 tee and the course is not exactly flat. 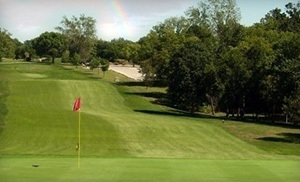 But in the Kansas City area, it is hard to top this combination of a great golf course that is also friendly to those on foot. It’s also got a rural feel, surrounded mostly by countryside. The course has a variety of interesting holes and will not lull anyone to sleep. This course is on the same order as Minor Park, described below. Both are owned by the city of Kansas City and geared toward beginning players. Hodge is about as easy as Minor to walk. Actually, the pro shop will tell you that the toughest walk at Hodge is between the clubhouse and parking lot. Hodge plays just 5,707 yards from the white tees, which most people play . Even the back tees are just 6,108 yards. 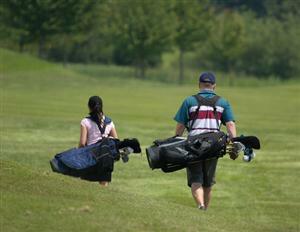 It’s good to have courses such as Hodge up north and Minor Park down south for leisure golfers who like to walk. This course, once famous for exceeding 8,000 yards from the back tees, has actually been set up for mere mortals for many years now. It plays 7,200 from the back tees, and 6,600 and 6,200 from the other two mens’ sets. And, of course, terrain rather than length determines a course’s walkability and Dub’s is fairly level with only a couple uphill hikes. Distances from green to tee are mostly reasonable, too. This is still a course that favors long hitters but it’s a not a punishing walking course and remains a fun challenge in the countryside. The front nine is fairly open and level and is quite a bit easier to walk than the back. The second nine s rolling and wooded with the holes more spread out than on the front. Holes are close together, making distances from green to the next tee consistently walkable. This course is not long at 6,300 from the back tees, but it is tight in spots and requires some accuracy. In recent years the course has removed a few bunkers and added zoisia grass. Formerly Victory Hills Country Club, the course turned 80 years old this year. It’s advertised as a course where “four hours would be the norm” as it is short, at 5,800 yards from the back. Holes are close together and convenient to walkers, but it’s a tight course. Painted Hills gets a lot of senior play and relatively few people walk it, but it’s certainly one where you can grab the bag and get around easily on foot. Tucked away in a cozy Grandview neighborhood, River Oaks offers a surprisingly pleasant and challenging course. Designed in 1973 by Dr. Marvin Ferguson, it was often favored by Royals and Chiefs players in the ‘70s. As wide-open country club courses blossomed in the Kansas City area some golfers moved away from River Oaks, but it retained a group of staunch advocates, all of whom laud its challenging aspects. The relatively short, par-71 course plays 6380 yards from the blue tees with most of the distance on the back nine. The extraordinarily slender fairways begin right out of the gate on holes #1 and #2, pars five and four, respectively, which play a lot longer than their yardage because of the need to be especially fine off the tee. The tight play becomes even more intimidating because of how the tree lines hug the fairways, requiring even more precise shots. Par three #3 features a picturesque tee shot over a creek onto a slim green and the water also plays a factor on the long, thin par five #4. These are followed by par four #6, at 408 yards, rated as the hardest on the course, and par four #7, a dogleg left. Par three #8 and dogleg right par four #9 round out a 3109-yard, par 36 front nine. The longer (3271 yards) par 35 back nine begins with par four #10, a sharp dogleg left, followed by one of the most enigmatic holes on the course, the par three #11. The course’s longest hole, par five #12 at 534 yards, is both straight and thin. Rated the hardest on the course, par three #13 seems easy enough at 147 yards off the blues – the shortest hole on the course – but features water hazards and bunkers, along with a smallish green to give even the best shot-makers trouble. Par four, dogleg right #14 is another hole requiring golf smarts. A long (429 yards) par four #15 is followed by an even longer par four (445 yards) par four #16. The par-three #17 with its beautifully laid-out green and a long, par-five #18 round out the back nine. 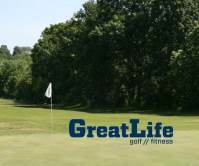 The course was purchased by GreatLife Golf & Fitness after it fell into disrepair and has been improving gradually since. 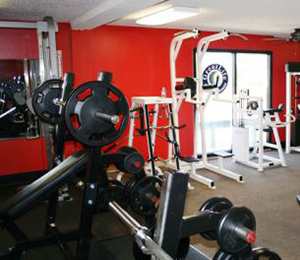 It is a “premier” course with family memberships available for $29.99/month. This summer, GreatLife has installed a new General Manager and superintendent, Chris Roberts, who will work to rehabilitate the less favorable parts of the facility. While there are some parts of the Bermuda/Zoysia fairways which have had maintenance challenges in recent years, the facility itself remains a fine destination. 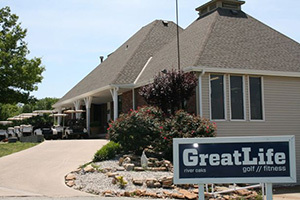 Reviews of the Zoysia greens and the friendliness of the staff are unanimously positive, as are the improving atmosphere of the deck, fitness center, and renovated clubhouse. Osburn, who has experience in sales and marketing, is spreading the word about River Oaks. Additionally, enrollment fees, which are typically $100, will be just $25, plus a pro-rated cost for July, reducing fees to only $32 to get started immediately as a member. Osburn also plans to bring in additional businesses and sponsors for more tournaments by next summer. He wants to make greater use of the deck, get the tennis courts up and going again, and to add a putting green near the clubhouse. With a family membership of just $29.99 per month, all these amenities coupled with challenging golf make River Oaks a great deal. Every golfer faces several difficult putts throughout a round of golf. Your goal should be to hole the ball in two putts or less every time. If you routinely make three putts or more there is a significant amount of room for improvement. For example, let’s say you average two putts on nine greens and three putts on the other nine greens. There is a quick five stroke improvement by cutting down from nine three putt greens to four three putt greens in your round. The putting stroke, similar to the golf swing, is an athletic movement. Therefore, begin with an athletic set up and continue with the correct fundamentals. Start with your feet approximately shoulder width and bend your knees slightly. Lean forward at your waist to create the proper spine angle. Allow your arms and shoulders to create a triangle at address. The arms should hang down below the shoulders while your eyes are positioned directly over the golf ball. The golf ball should be in the middle to slightly forward in your stance. Position both of your thumbs so point down the flat part of the grip. Gripping the club correctly will help keep the putter square through impact. After you achieve the correct set up, allow your arms and shoulders to create a rocking movement, known as a pendulum motion. During the backswing, the left shoulder will move down while the right shoulder moves up. Consequently, the forward swing will push left shoulder back up while the right shoulder returns to a lower position. Keep the putter low to the ground during the backswing and follow through. The lower body should remain completely still throughout the stroke. Focus on keeping your eyes fixed down on the ball and accelerate through impact. Finally, avoid taking a big backswing and short forward swing. Decelerating is one of the most common mistakes in any golf shot. The following statistics obtained from the PGA Teaching Manual should demonstrate how important it is to get the ball close to the hole. On average, a scratch golfer will make a 3-foot putt 82% of the time while they only make a 6-foot putt 48% of the time. On average, an 18 handicap player will make a 3-foot putt 64% of the time while they only make a 6-foot putt 35% of the time. Finally, on average, a 36 handicap player will make as many 3-foot putts as a scratch player will make 6-foot putts. Based on the previous statistics, focus on getting the ball closer to the hole. When facing challenging putts always try to give yourself an opportunity to make the next putt. Imagine a circle around the hole approximately 3 feet in diameter. As you know, percentages of making a shorter putt are much higher than holing a longer putt. 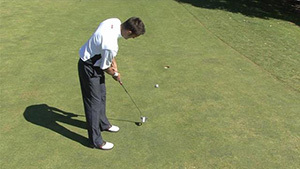 Practice lagging the putt close to the hole from longer distance. A good lag putt positions the player to have a simple putt on the next stroke. The lag putt typically stops short of the hole. I routinely practice two drills to keep my putting stroke and feel sharp. To learn the correct distance, practice a ladder drill. 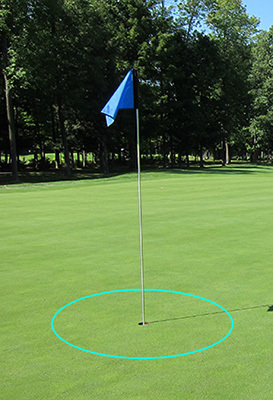 Begin by placing markers such as tees on the green in increments of ten feet. Practice hitting putts to the different lengths. It is great if you make long putts, however, the goal is to master different distances so you have more putts inside a three foot radius. 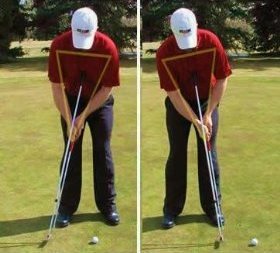 The clock drill improves focus and confidence for putts inside ten feet from the hole. Begin by placing three balls in a line at three, six and nine feet from the hole in four directions around the hole, similar to the twelve, three, six and nine positions on a clock. The goal is to make all twelve in a row. If you miss any putt, then you go back to the beginning and start over. While it is extremely difficult to make all twelve putts, you essentially reinforce your ability to make the shorter putts.